Djimon Gaston Hounsou (/ˈdʒaɪmən ˈuːnsuː/; French: [dʒimɔ̃ unsu]; born April 24, 1964) is a Beninese actor and model. Hounsou began his career appearing in music videos. He made his film debut in the Sandra Bernhard film Without You I'm Nothing (1990) and gained widespread recognition for his role as Cinqué in the Steven Spielberg film Amistad (1997). He gained further recognition for his roles in Gladiator (2000), In America (2003), and Blood Diamond (2006), receiving Academy Award for Best Supporting Actor nominations for both the latter films. He also had a minor role in Furious 7 (2015). He has been nominated for a Golden Globe Award and three Screen Actors Guild Awards. Djimon Hounsou plays an important role as well in the French movie Forces spéciales in 2011. Hounsou was born in Cotonou, in what is now Benin, to Albertine and Pierre Hounsou, a cook. He immigrated to Lyon in France at the age of twelve with his brother, Edmond. Soon after arriving in France, Hounsou dropped out of school and became homeless for a time. A chance meeting with a photographer led to Hounsou being introduced to fashion designer Thierry Mugler, who encouraged Hounsou to pursue a modeling career. In 1987, Hounsou became a model and established a career in Paris. He moved to the United States in 1990. Between 1989 and 1991, Hounsou appeared in the music videos for "Straight Up" by Paula Abdul, "Love Will Never Do (Without You)" by Janet Jackson, and Madonna's "Express Yourself". He also appears in En Vogue's music video for "Hold On". Hounsou's film debut was in the 1990 Sandra Bernhard film Without You I'm Nothing. He had television parts on Beverly Hills, 90210 and ER and a guest starring role on Alias. Hounsou had a larger role in the science fiction film Stargate. Hounsou received wide critical acclaim and a Golden Globe Award nomination for his role as Cinqué in the 1997 Steven Spielberg film Amistad. He gained further notice as Juba in the 2000 film Gladiator. 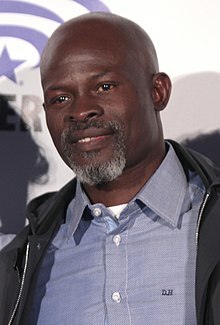 In 2004, Hounsou was nominated for the Academy Award for Best Supporting Actor for In America, making him the fourth African male to be nominated for an Oscar. In 2006, he won the National Board of Review Award for Best Supporting Actor for his performance in Blood Diamond; he received Broadcast Film Critics Association, Screen Actors Guild Award, and Academy Award nominations for this performance. Hounsou acted in a supporting role in the 2009 science fiction film Push, as Agent Henry Carver. In 2011, he starred as a French commando in the French film Forces spéciales. Director Tim Story told IGN that if he were to do a third Fantastic Four movie, he would like to have Hounsou as the Black Panther. In November 2008, it was announced that Hounsou would be providing the voice of the Black Panther in the television series of the same name. Hounsou had signed on to play Abdiel in the film version of John Milton's Paradise Lost with Benjamin Walker and Bradley Cooper. The film however was scrapped in early February 2012. In 2013, he appeared in the comedy film Baggage Claim alongside Paula Patton. He also voiced Drago Bludvist in How to Train Your Dragon 2 and portrayed Korath the Pursuer in the Marvel Studios film Guardians of the Galaxy, both in 2014. He played villains in two 2015 films, Seventh Son and Furious 7, the seventh installment of The Fast and the Furious film series, the latter where he played the role of Mose Jakande, a Nigerian-French mercenary. On February 17, 2016, it was reported that Hounsou would join the second season of the television series Wayward Pines. In July 2018, Hounsou joined the DC Extended Universe, voicing the Fisherman King Ricou in Aquaman (with the character being motion-captured by Andrew Crawford), as well as replacing Ron Cephas Jones as the Wizard Shazam in Shazam! (2019). Also in 2019, he reprised his role as Korath in the Marvel Studios film Captain Marvel. On February 24, 2007, it was announced that Hounsou would be the new Calvin Klein underwear model. At the time, Hounsou was being represented by Los Angeles modeling agent, Omar Albertto. In 2010, Hounsou was featured as the narrator in ESPN's running series of "32 teams, 1 dream" commercials for the 2010 FIFA World Cup. Hounsou spoke at the Summit on Climate Change at the United Nations on September 22, 2009. On December 1, 2009, Hounsou told French media that developed countries "need to be held accountable" for their contribution to climate change. In 2007, Hounsou began dating model Kimora Lee Simmons. In May 2009, Simmons gave birth to their son. Hounsou and Simmons visited Hounsou's family in his native Benin in the summer of 2008, where the two participated in a traditional commitment ceremony. The couple were adorned in traditional clothing and used the ceremony, in the presence of Hounsou's family, to solidify that they are "dedicated to each other 100%". The two emphasized that the ceremony was not a wedding. In the début of Kimora Lee Simmons' show, Kimora: Life in the Fab Lane, he was billed as her husband. Hounsou and Simmons, who were never legally married in the United States, announced their separation in November 2012. 1990 Beverly Hills, 90210 Doorman Episode: "Class of Beverly Hills"
(voice) Episode: "Luck Be an Aye-Aye"
2001 Soul Food Victor Onuka Episode: "Games People Play"
^ Hounsou, Djimon (May 26, 2016). "Tonight at 9/8c on #foxtv #waywardpines". Instagram. ^ a b c d e "Djimon Hounsou: Biography". TV Guide. Retrieved 22 November 2012. 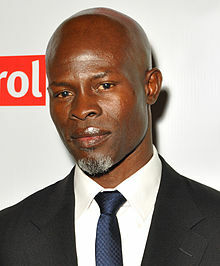 ^ a b "Djimon Hounsou Biography (1964-)". Filmreference.com. Retrieved 2012-11-15. ^ "Daily Show". Comedy Central. Retrieved May 10, 2017. ^ "Straight Up". Paula-Abdul.net. Archived from the original on 2012-09-17. Retrieved 2012-11-15. ^ "Love Will Never Do Without You". songfacts.com. Retrieved 2012-12-20. ^ "Djimon Hounsou Awards". imdb. Retrieved 13 November 2013. ^ "Push Djimon Hounsou Interview". About.com. Retrieved 13 November 2013. ^ "Djimon Hounsou and Diane Kruger's SPECIAL FORCES Explodes onto Blu-ray & DVD in February". January 17, 2013. Archived from the original on 13 November 2013. Retrieved 13 November 2013. ^ "Story talks black panther". ign.com. 8 May 2007. Retrieved 19 September 2015. ^ "Djimon Hounsou Roars as the Black Panther". ^ "Legendary Pulls Plug on Bradley Cooper's 'Paradise Lost'". Hollywood Reporter. Retrieved 19 September 2015. ^ "Alan Taylor Offers New 'Thor 2′ Details; Djimon Hounsou on 'Guardians of the Galaxy'". screenrant.com. Retrieved 13 November 2013. ^ "Marvel Studios Begins Production on Guardians of the Galaxy". Marvel.com. July 20, 2013. Retrieved July 20, 2013. ^ "Djimon Hounsou Joins Fast & Furious 7". empireonline.com. 12 September 2013. Retrieved 13 November 2013. ^ Wagmeister, Elizabeth (February 17, 2016). "Djimon Hounsou cast in 'Wayward Pines' season 2". Variety. Retrieved February 18, 2016. ^ "Exclusive: DC's 'Shazam!' casts 'Guardians' actor Djimon Hounsou as the Wizard". EW.com. Retrieved 2019-03-08. ^ "Exclusive: 'Aquaman' reveals first look at the exotic Fisherman King". EW.com. Retrieved 2019-03-08. ^ "Omar Albertto on FASHION NET". www.fashion.net. Retrieved 2018-02-09. ^ "Calvin Klein's New Brief Boy". ashionweekdaily.com. February 23, 2007. Archived from the original on 13 November 2013. Retrieved 13 November 2013. ^ "Developed countries need to be held accountable". Rfi.fr. 2009-12-02. Retrieved November 15, 2012. ^ Slonim, Jeffrey (November 15, 2012). "Russell Simmons Okay with Kimora & Djimon". People. Retrieved March 11, 2019. ^ "'Life in the Fab Lane' star Kimora Lee Simmons gives birth to baby boy". Reality TV World. June 1, 2009. Retrieved March 11, 2019. ^ "Kimora Lee Simmons, Djimon Hounsou Had Commitment Ceremony". Usmagazine.com. 2009-03-09. Retrieved November 15, 2012. ^ Jordan, Julie (November 21, 2012). "Kimora Lee Simmons and Djimon Hounsou Separate". People. Retrieved 11 March 2012. ^ "Winners: National Board Of Review". cbs news. Retrieved 19 September 2015. ^ "Screen Actors Guild: The nominees". ew.com. Retrieved 19 September 2015. Wikimedia Commons has media related to Djimon Hounsou.